Emmanuel Podestá Junior, a researcher advised by Prof. Márcio Castro, graduated with honors in Computer Science. 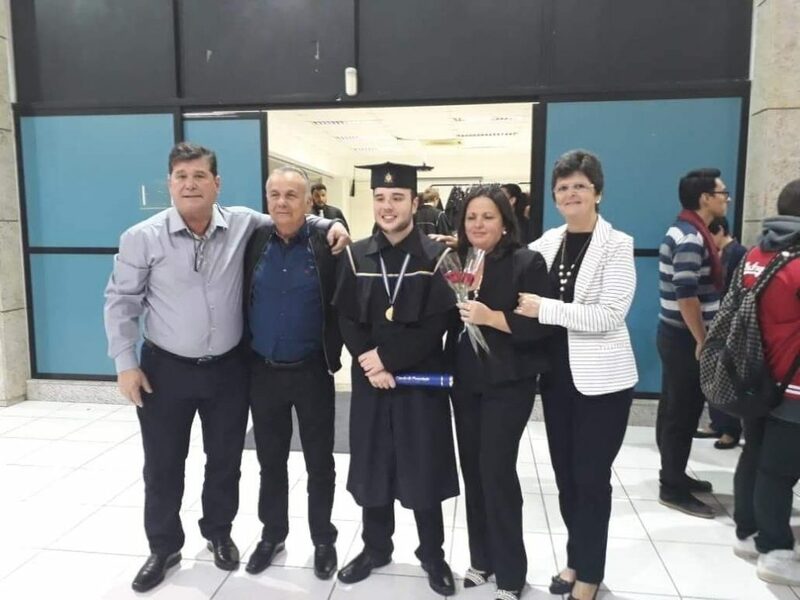 He received a diploma of merit during the Computer Science Commencement Ceremony at the Federal University of Santa Catarina (UFSC) on August 17h, 2018. This distinction is given to the student who had the highest grade point average. 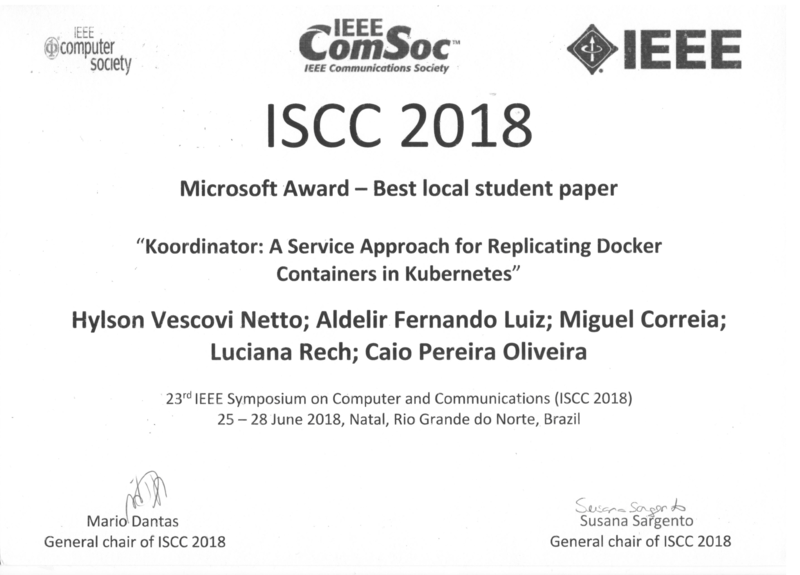 The paper entitled “Koordinator: A Service Approach for Replicating Docker Containers in Kubernetes“, co-authored by Hylson Vescovi Netto, Aldelir Fernando Luiz, Miguel Correia, Luciana Rech, and Caio Pereira Oliveira, received the Best Paper Award at the IEEE Symposium on Computers and Communications (ISCC 2018), which took place in Natal/RN, Brazil from June 25th to 28th, 2018. This work was developed in partnership between researchers from LaPeSD and INESC-ID. 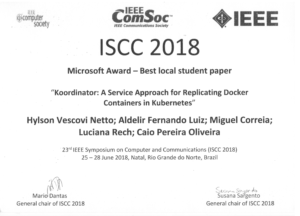 The awarded paper presents Koordinator, a new container replica coordination approach that provides availability and integrity with strong consistency in Kubernetes. 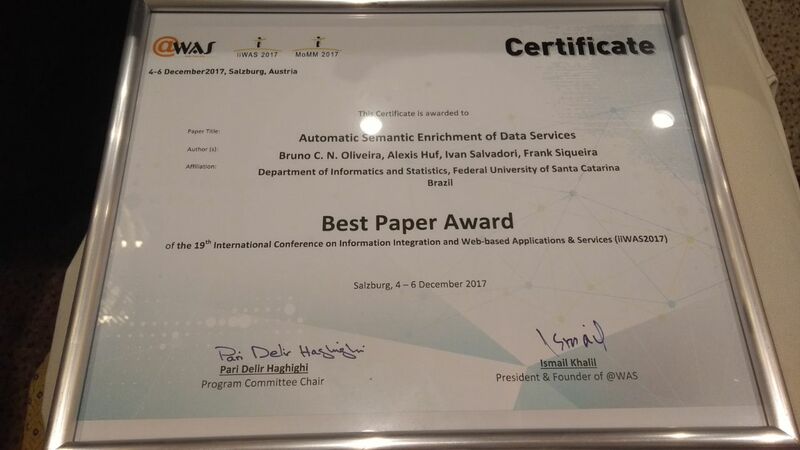 The paper entitled “Automatic Semantic Enrichment of Data Services”, co-authored by Bruno Oliveira, Alexis Huf, Ivan Salvadori and prof. Frank Siqueira, from LaPeSD, received the Best Paper Award at the 19th International Conference on Information Integration and Web-based Applications and Services (iiWAS 2017), which took place in Salzburg, Austria from December 4th to 6th, 2017. The awarded paper describes a software developed at LaPeSD, called OntoGenesis, which allows the semantic enrichment of data provided by services available on the Web, aiming to facilitate their integration with other data sources. 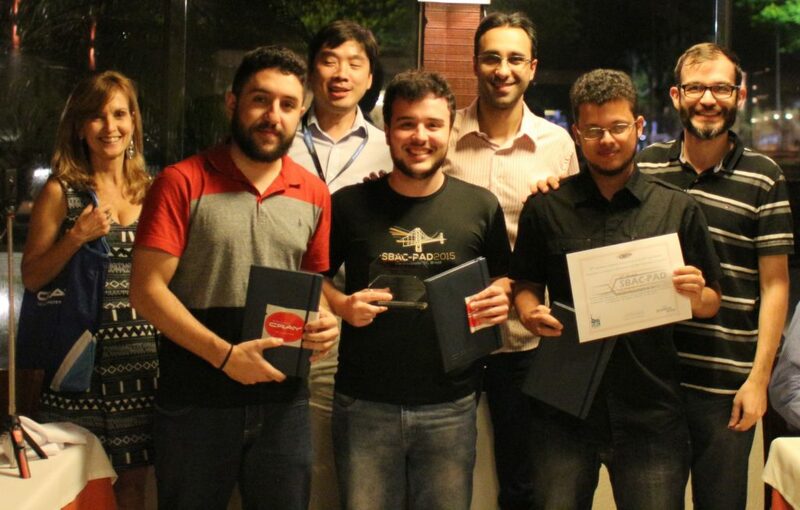 The LaPeSD/UFSC team (Alyson Pereira, Emmanuel Podestá Jr. and Bruno Marques) is the 2nd-place Winner of the Marathon of Parallel Programming, which was held in conjunction with International Symposium on Computer Architecture and High Performance Computing (SBAC-PAD) and Simpósio em Sistemas Computacionais de Alto Desempenho (WSCAD) in Campinas/SP. Each team consists of three students members and a coach. They have about 5 hours to solve up to 9 problems. For Local Contest, the teams can also bring printed hard copy material (e.g. books, manuals, notes, papers). Judgment is strict. In the beginning of the contest, teams receive problem descriptions and sequential (serial) solutions. 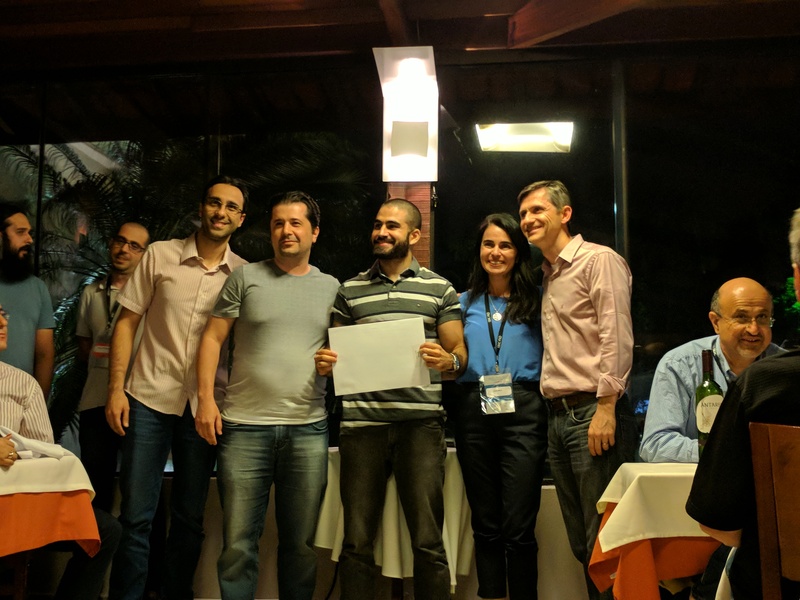 Resolution involves not only the correct problem solution but also performance speedup for parallel (or distributed) version, measured according to criteria defined by committee for current contest. 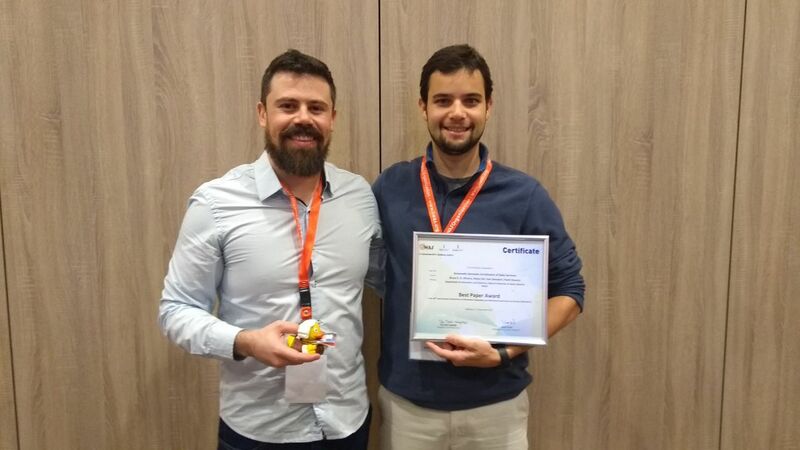 Pedro Penna has received a Second Best Paper Award at Simpósio em Sistemas Computacionais de Alto Desempenho (WSCAD) for the paper entitled BinLPT: A Novel Workload-Aware Loop Scheduler for Irregular Parallel Loops. In this paper, Pedro presents some of the results he obtained from his master thesis at PPGCC/UFSC. This work has been done in collaboration with other researchers from PUC-Minas and Université de Grenoble Alpes (France). Pedro was advised by Prof. Márcio Castro and Prof. Patricia Plentz.